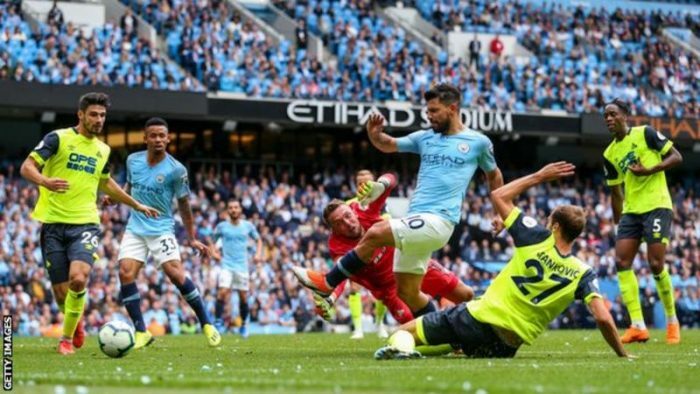 Pep Guardiola’s side, who beat Arsenal 2-0 in their opener, lost only once at home all of season and victory never looked in doubt against the Terriers, who have two defeats from their first two matches of the campaign. Jon Gorenc Stankovic gave the visitors the slightest glimmer of hope before half time when he poked in from Steve Mounie’s flick-on, but any optimism was snuffed out early in the second half by a brilliant free-kick from David Silva. Aguero then wrapped up his hat-trick with a smart flick from Benjamin Mendy’s cross – before a Terence Kongolo own goal sealed an emphatic win for an impressive City.